Demaris Cornelia Evans [Coltharp] (1819-1853) was born into a Quaker family. Her father, Robert Evans, purchased land in Monroe Co. in 1826, and the family moved to Madisonville. As there were no Quaker meetings in Monroe Co. until the 1870s, the Evans family attended the Chestua Baptist Church, which was established in 1833. Cornelia married John Horner Coltharp, a farmer, in Sep. 1842. She stitched her sampler in Jan. 1843 prior to her first pregnancy. Damaris had been married approximately three months when she finished her sampler. 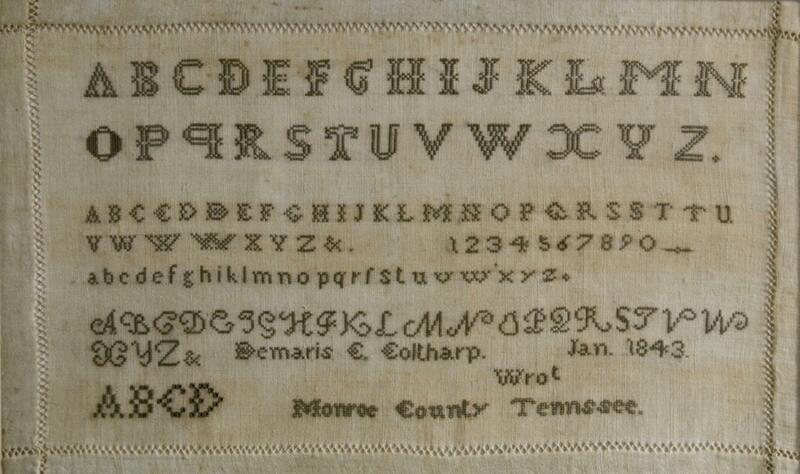 The German double-barred alphabet is unusual for Tennessee samplers. The hemstitching is very elaborate and well done. 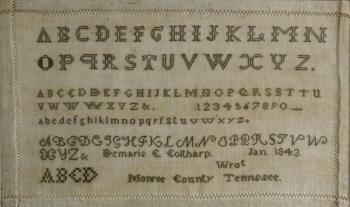 Her sampler is stitched in black thread and features the distinctive Quaker alphabet.